There is always a huge market of people looking for information to help them find a job, write a resume or application letter, prepare for an interview, as well as tell them where to find the most job posts. 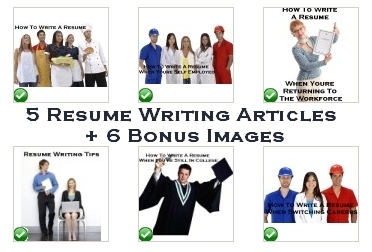 If you are a blogger in this niche or an affiliate marketer promoting products or services to jobseekers, you will get a ton of value from this top quality PLR resume writing content, which even includes 6 bonus graphics to help illustrate your posts or use for social networking memes to drive even more traffic to your pages! When you're still in college, writing a resume can be a daunting task because you may feel you don't have anything to put on a resume, but be assured that you can have an outstanding resume when you're just getting started. The purpose of a resume is to tell a future employer why they should hire you over someone else. That's it, it's that simple. Learning how to write a resume when you are still in college will help you develop valuable skills you'll need later on in your career, so writing one now is good practice. By writing a resume, you're forced to think about your strengths and your assets, and understand how to use them to land a job. Writing a resume as a college student will also help you see if there are any areas you need to work on before graduation so that you'll be able to begin your career as soon as possible. These articles are exclusively available from my store only - a bargain at only $4.50 for the lot.